How about other instant prizes? Do you LIKE Eversave Baltimore on Facebook? What about following EversaveBWI them on Twitter? We can't forget about Eversave Washington DC? Eversave has no problem sharing their love for their fans. Now, it's your turn to return the favor. 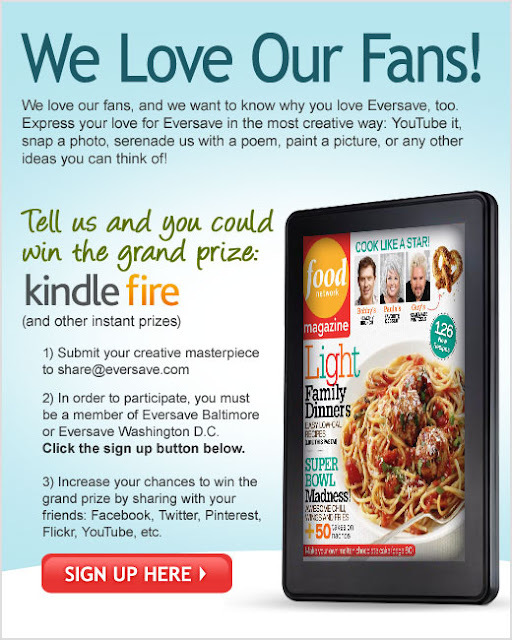 Check out the details below on how you can win the grand prize of a Kindle Fire (and other instant prizes). Creativity is the word...so make it count. Get your thinking cap on and show some love. Valentine's Day may have ended, but love is continuous. There was no monetary compensation for writing this post. However, Eversave is one of my affiliates. The opinions and views are my own.